First, a confession: I’m a collector and I always have been. Ever since I’ve had money I’ve found something to spend it on, and then I’ve spent a lot of money building a collection of those particular things. For the past few years that particular collation has been video game collector’s editions. They’re seriously like crack for me. Don’t believe me, have a look at these. Impressed, huh? And a little scared you say? That’s an odd reaction, what are you, a weirdo? Anyway, collector’s editions have been around for a while now but it wasn’t until the last generation of consoles that they became what they are today, a mix of physical loot and exclusive digital content that gives you something awesome to display and a few little bonuses for playing the game. 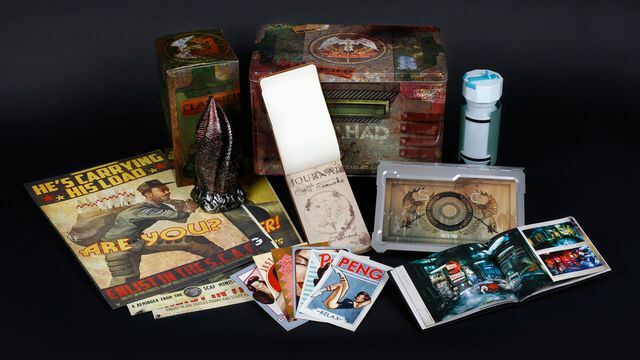 It is a perfect mix of extras in my opinion, and one that has paid off with Collector’s editions generally selling out in pre-orders and being sold for huge mark-ups on eBay and the like. At least, that’s how it is in Australia. I’m sure I could bore you with some really cool things that I have in my CE’s, which I could. Seriously, I could. It would be awesome. But that isn’t what this article is about. I know I’m new to the CE game, and that there are people who have been collecting for a lot longer than I have and have much more impressive collections probably with glass cabinets and little brass plaques. Okay, so I may have given this a little too much thought. Nonetheless, I am still a collector and I’m beginning to worry about the future of the CE. Moving, as we have, into a new generation of consoles, we have already seen that not too much is changing as people hate change, and people have the money. But Microsoft and Sony, and even Nintendo to some extent, have already made the future of gaming clear: everything is online. Now apart from DRM and always on connectivity (which are big points, I know, but not the focus of this article) we’ve already seen a big push towards buying games online and downloading them as opposed to buying the physical media. Off the bat, this is a much more profitable way to sell for the publishers than having media in stores. The money goes straight to them and there’s no worry about this pesky game sharing or the pre-owned games fiasco. But this really only works if the prices are adjusted accordingly, which does happen. It is generally cheaper, in Australia at least, to buy your Triple A title off of the console market at launch than to buy it in store. But in terms of time, it’s quicker to buy from the store to play than to download it with Australia’s current internet speeds. And then we have the sales, something I didn’t think Microsoft knew how to do properly until recently when they started offering some premium titles for under $10, which is absurd. Both Sony and Microsoft are also rewarding their subscribers with free games through services such as PlayStation Plus and Games for Gold, plus Sony gives those subscribers even further discounts on things in their marketplace making paying that subscription fee even more worth the cost. So all in all, digital is the future of games and that future is already here. Even though your Xbox One and PS4 will still offer physical media, how long will that last before digital becomes the norm? I do not doubt we’ll see it within the life of the current gen of consoles with the profit margin higher and capable network infrastructure in most of their major markets, it would be stupid not to move towards it. Game retailers may still exist at this point but the market split would be further in favour of direct download games. So, what does this mean for collector’s editions? There may already be a solution handy, thanks to Blizzard. 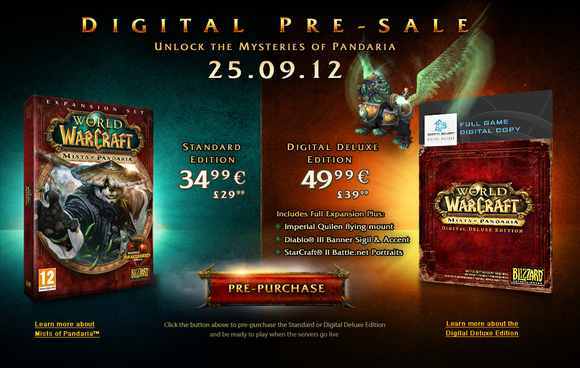 With the release of “Mists of Pandaria”, an expansion to their multi-million MMORPG “World of Warcraft”, they had two special editions available: The standard Collector’s Edition with the mix of physical goodies and digital vanity items and the Digital Deluxe Edition which had all the same digital vanity items, but cost about $20 cheaper. Blizzard also put a limit on how many of these DDE’s were sold giving those who managed to snag one the standard gloating rights over the general populous. So, this could be our solution, offer just digital bonuses and limit the amount sold to keep those who want the prestige happy and keep your costs down by not spending money on art books, soundtracks and statues. The problem with this can be seen on the Xbox Marketplace. On The Xbox One you can currently buy digital special editions of games with the extra content included, which is a step in the right direction. The price, however, remains at a premium. The same as, if not more than, you would pay retail. So where has this extra cost come from? Surely a digital bonus can’t cost that much to produce, and if it comes down to the exclusivity of premium edition content, l can’t see them handling it any better than they have before. When “Bioshock Infinite” came out I pre-ordered and went to collect my Ultimate Songbird edition which is really quite cool. As well as the statues and other goodies it came with it gave you a few free pieces of gear to start the game with which made life a little easier, especially if you did your first playthrough in 1999 mode like I did (Konami Code FTW). So I had that, and was happy knowing that buying the CE version gave me fantastic bonuses when playing the actual game. A month or two after release and the Xbox Marketplace had the “Columbia’s Finest Pack” for the game, which not only included the content I just mentioned but also the bonuses from the Premium Edition… all for a fraction of the cost! All of a sudden, the premium I paid seems lessened. As much as I still have my physical CE for display, the digital side now means nothing when it’s offered at a very low price later down the track. The prestige and bragging rights are gone when everyone has access to it. And this is what worries me. If we remove physical media, and in turn retail stores, collector’s editions must become digital, there’s no reason for them to remain as a physical item but that does not necessarily mean they have to disappear entirely. Visceral Games released the Dev Team edition of Dead Space 3, a physical collector’s edition counterpart to the game that could be ordered separately, but limited to a certain number of copies, so the exclusivity remained. But how likely is it that companies will continue to do that? Once again, the costs are higher and they may feel like they’re offering enough with a digital CE that a physical is no longer necessary. But if the age of Digital CE’s comes, and that extra content that you’re paying the premium for eventually gets released to everyone, there’s no point to it. I can just wait and buy it when it’s on sale 3 or 6 months down the track, I have no qualms about doing that at all. But when that day comes, I hope that the idea of a good CE is kept and that those bonuses remain exclusive, otherwise paying full price for content that everyone else will have access to eventually is a pointless exercise, and even the most avid of collectors will eventually stop when a collection is nothing more than a list of names of a hard drive with the words “Collector’s Edition” next to it. A phrase that used to mean something.